There was a question I was going ask about music and I'll put it here. My daughter (age 7) starts violin lessons today. The instructor seemed to think that parent participation was the BEST way to go so I'm taking lessons too. Kinda of exciting actually. What I'm curious about though is how big music is in other hs students lives? How many hs parents play instruments too? I realize its different for everyone but I thought it might be a nice friendly way to get a chat going! We are a music family! My grandpa was a trombonist and conductor. My mom taught me my first piano lessons, and how to lead music. My dad was determined that our family learn to sing in harmony and perform on a volunteer basis. I took piano from 2nd grade through 12th, violin from 4th through 12th, and some organ lessons here and there. I have also taught piano to several students of various ages, and led a lot of singing at church including the choir and directing several musicals. So I have taught my 3 instruments to my kids, and by using teach-yourself books with my help, different ones of them have also studied harmonica, clarinet, guitar, flute, trumpet and voice. My 6-y-o DD started piano today and my 15-y-o started learning to teach piano. She is also starting her second year studying with a private flute teacher. We all love to sing in the church choir, and last year most of us auditioned for a musical. 3 of the kids actually performed in it. DH plays piano and occasionally fakes it on the organ, conducts and sings. My husband plays guitar, and my daughter (age 9) is learning from him. I love music but don't play an instrument. My daughter took dance lessons last year. She loved this, but we did not fit in with it very well. Not because I am a snob, but the music choices and the language and such conflicted with what we wanted our child to be exposed to. My mom says you shouldn't shelter a child by homeschooling but I don't think picking and choosing appropriate social things is sheltering. She was in 3 years of public school and already was hearing some topics that were beyond her. We do love music. My daughter likes to sing and we listen to a variety of music. Any suggestions on a basic music program (cheap) that I could begin to teach her. I took 3 Years of clarinet in grade school, but that is the extent of my lessons. my hubby doesn't read music so he can only teach her so much. We are a musical family. I teach the boys hymns, and other songs that i think they need to know, like "america" and "The star spangled banner" then we learn goofey songs, like goober peas, and Oh Suzanna. We play many instruments but mostly, guitar, flute, piano, harmonica and violin. I am trading lessons with a fellow homeschool mom. I teach piano, she teaches violin. We also have music on all the time, in the background. I love to sing and we make up songs about what we are learning, and I sing while I work, the boys are always exposed to some kind of music and they love it! You don't need a curriculum, just let it be part of your life. My wife and I sing.. she plays piano a little.. I play Saxophone and various flutes and recorders..
Thats neat thats its such a big aspect of peoples lives. I play a doumbek which my 7 yr old has really taken too. We each have a harmonica that we like to goof off with. I also own a guitar that my 15 yr old plays much better than I. We started the violin lessons and love it! I am teaching two of my kids piano, and after October 1 will be teaching two more. I have taught my 13yo how to sing. Quite an accomplishment since I didn't know I knew how to do that. My 13yo plays sax, he took private lessons for a year and a half, and just started in the homeschool band. My 11 yo plays guitar, he takes private lessons. My 8yo plays flute, which I teach her. The 6yo and 9yo are currently taking piano. We are looking for a violin for the 9yo. The 6yo wants to play trumpet, but that will be in a few years. After we move, I want to start a recorder class for the three youngest at least. We will just have to see about that. and you'll have your own band in the house.. 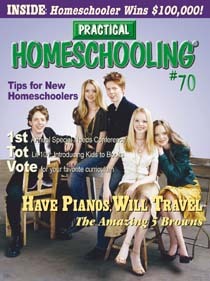 If anyone can get their hands on a copy, we have an article in Practical Homeschooling #70 about five homeschooled siblings whose debut CD was #1 on the Classical Music chart. They all play pianos, which allows them to put together extremely complicated musical compositions. How neat is that! I'd love to hear them. I'm so surprised that some of you have taught piano. I tried to teach my husband (when we were just friends) but got caught up because I didn't know the order of when to teach what. The lessons didn't last long. I want to teach my children how to play. They're very musical already and know rhythm very well. I'm just wondering what curriculum or books I could use. For now I'm teaching them on their little toy pianos (one is part of a book and another is a stand up Barbie toy piano. I think I've heard people actually music for toy pianos or something like that...) to know where Middle C is and G. We sing a song in our math time that they like to play after me. I guess I could just teach them the notes and scales. Does anyone recommend any curricula or books? My kids are 5 and 4. Violet, I'm the same way -- 10 years of private lessons + orchestra ... I can hardly even tune my violin & viola (by then we're both frustrated enough to just move on to something else) I wish I could afford lessons for her!